Don’t we all just love the internet? It has given us access to everyone, everywhere, at any time. We can use it to get to the entire sum of human knowledge and history in an instant (and, with the arrival of smartphones and wi-fi, we can do this from a field in the middle of nowhere). We can instantly share new ideas and thoughts, from scientific breakthroughs to new songs and art. It is truly a marvelous creation, the internet. Unfortunately, with the internet comes the opportunity for previously shy and retiring souls to take altogether more unpleasant qualities. Across websites and forums, you get people who just love to stir up trouble, for no reason other than because they can. These people might think themselves impressive. Armed with anonymity, they can freely express themselves – and sling mud – without fear of consequences. There is of course another way to regard these people – cowardly keyboard warriors, or ‘trolls’. Now, making use of an internet pseudonym does not, in this author’s humble opinion, make someone a coward. Nearly everyone on the internet does so, and with good reason – there are plenty of people out there who, if they get hold of enough of your details, can and will use that information to steal funds from your bank account, commit fraud in your name, etc. That being said, there are people out there who use the cover of a nickname to become incredibly belligerent. They know they cannot be traced back to their words, so they can get away with virtually anything. 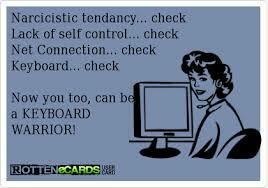 I’ve had the misfortune of encountering such keyboard warriors. They sit behind their computer screens, prepared (for years in some cases) to rant and rave about the people or things they hate, often making hurtful remarks or vicious accusations. The mentality of these people is just baffling. Why do they do it? I think the mentality is similar to that of the playground bully – they need to boost a failing ego by attacking others, which the only way they have of feeling better about themselves. It’s a desperate cry for attention, and if we ignore them, hopefully they’ll eventually go away.